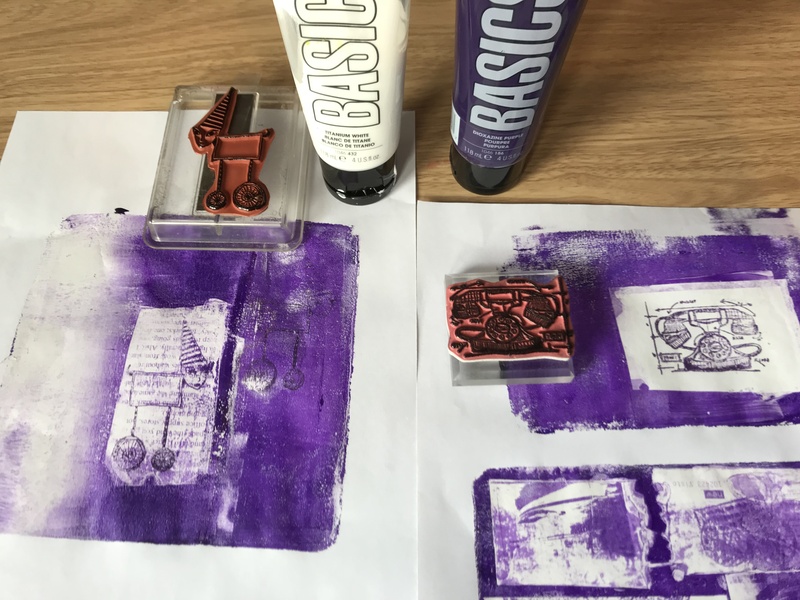 NOTE: Might be worth reading the next post before you embark on the stamping technique! I have not really felt up to much crafty play for quite a while. 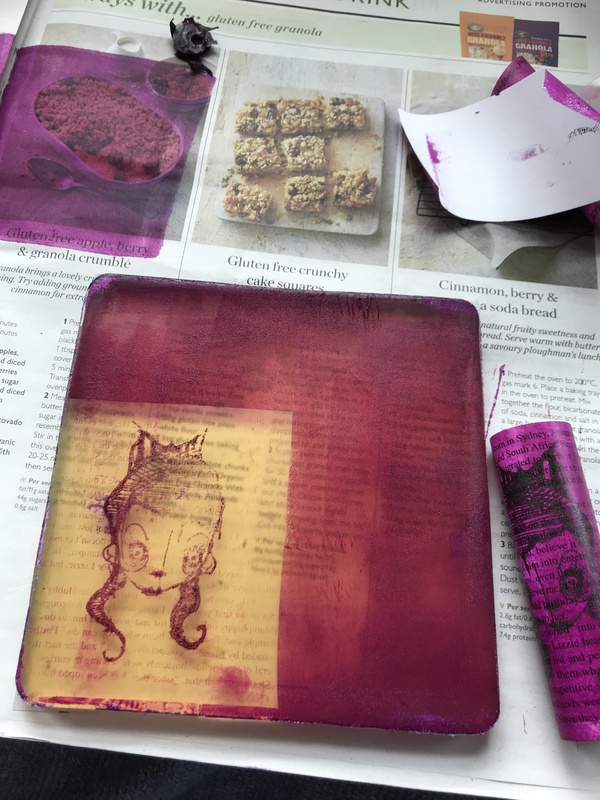 BUT I have been dreaming about the Gelli plate and remembering how much fun it was to play with. 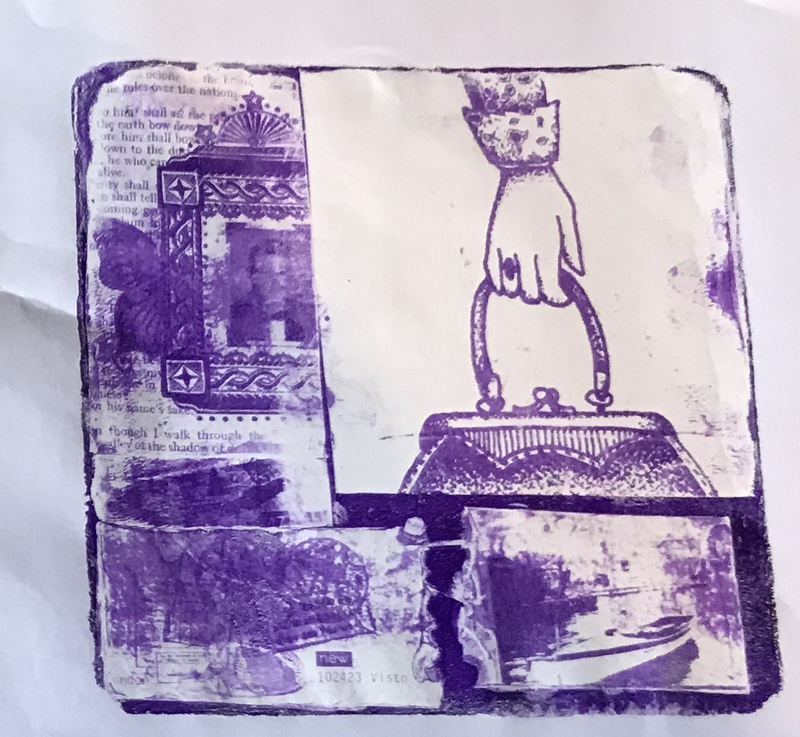 I watched a video – well more than one, I’m sure – about resist transferring of a magazine image on to the plate, which you then pull off by doing a basic, heavy-bodied paint pull. This one is the first one I saw, I think. 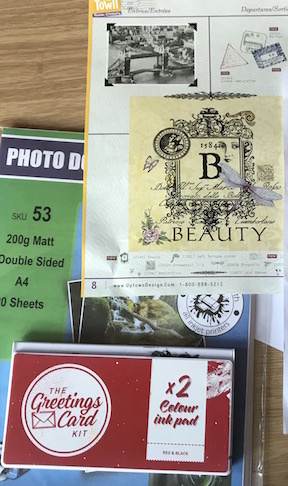 There was mention in some videos about the combination of the ink and glossy paper quality making a big difference. Looking thru may magazines, which are mostly scrapbooking ones, I came across my ancient Rubberstampmadness mags. The paper seemed thick and glossy and it also seemed that the image weren’t fashion shots but art and stamp samples. There are a lot of stamp catalogs full of cool images, and some printed art work, like the BEAUTY image here that would all make very cool prints or additions to other art. And guess what? They worked a treat. One video mentioned that some people had success with printing on an ink jet printer and doing the same process. I did not. I tried printing on pain paper, photo paper, on coated matt cardstock, on sticky label paper, etc. etc. and nothing worked. So that gave me a bit of an idea. If I stamped on to the glossy paper, might that transfer? 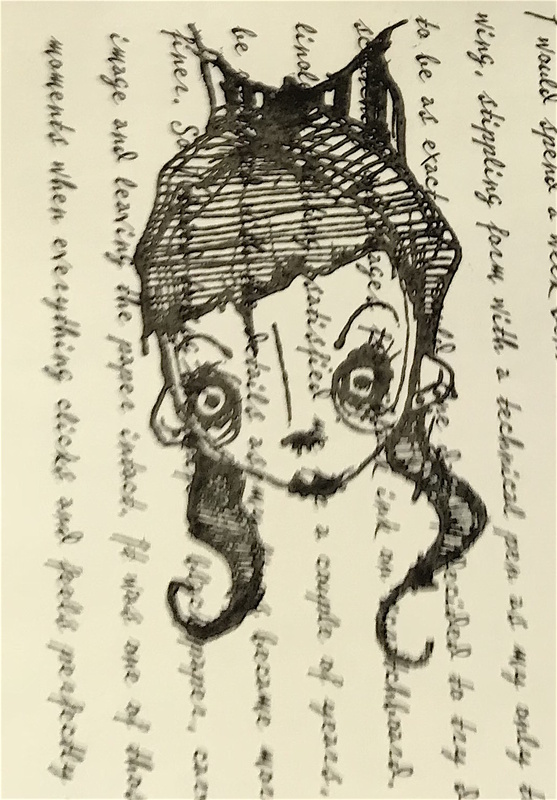 I experimented with about 8 different inks and a stamp. The ones I had the highest hopes for (Archival Ink, Clearly Better clear stamp ink, Staz-on and Memento) were all fails. Not expecting much I tried Distress ink, Distress Oxide ink, Adirondack and Kaleidoscope. Also all fails. Just on a whim I tried PIGMENT ink. Crazy, but it worked. I did have a few fails using cheaper paint but the Basics was good pretty much every time. 1. 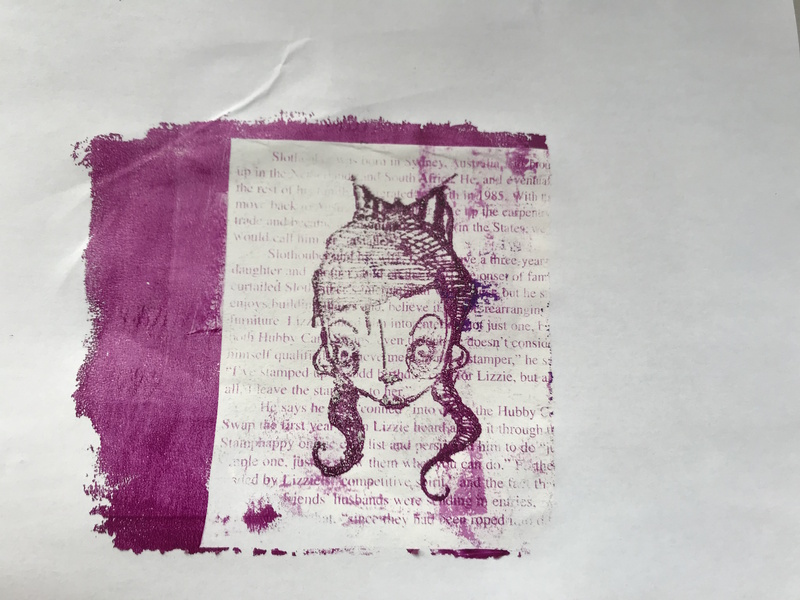 Stamp the image using pigment ink. Get a good coating of ink on the stamp. Sorry for the poor quality there – I had already used the image before I realized the photo was crap. Doh! I suspect things like Versamagic or maybe even chalk ink MIGHT work, and COLOUR pigment ink will add a different dimension to it if it works! – I’ll try that next and see. But this is very generic black pigment ink. I let the image dry but when I tried to dry it with the heat gun then transfer it, it didn’t work. So I think the ink needs to by dry-ISH but not super dry. 2. 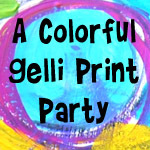 Roll the paint onto the gelli plate. I find the darker colours work best for this stage. You need a thin coat but not too thin. 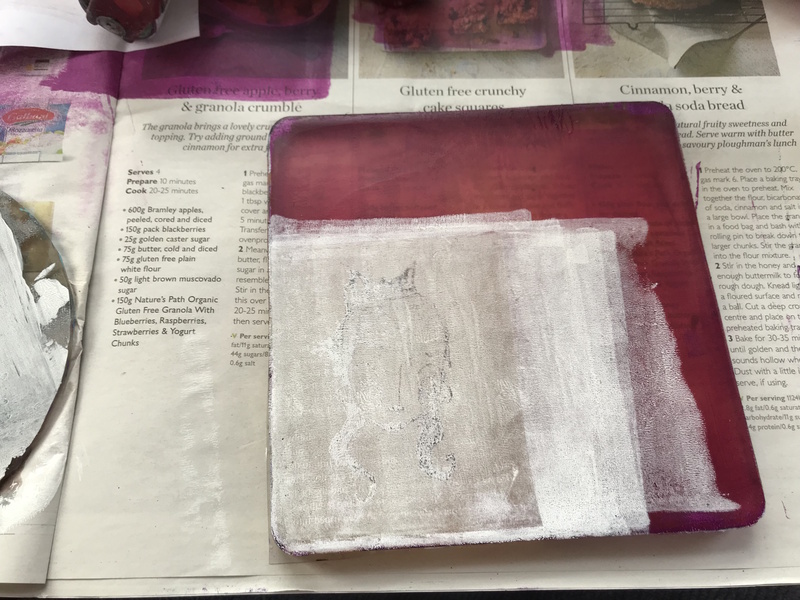 Press the stamped image into the paint – I burnished one with a teflon spreader. one with my fingernail, one with a spoon. Just make sure you get good contact. Remember the old Creative Palette that I hated? I used one of the bits to roll out the white paint and get a thin coat on the brayer. But you can also load the brayer by rolling in in paint on scrap paper. Not too thick a coat. As mentioned in a few of the videos, if you can SEE the image slightly, it’ll be a good print. Pull it. Give the back a good rub. And the coolest thing is that the text from the magazine transfers too! I am so happy to have had a play. It was seriously fun. 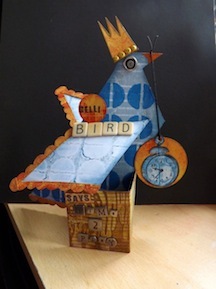 And now I know I can use my stamps as well as magazine images I am looking forward to more playtime! Maybe even more regular blogging? Maybe….. 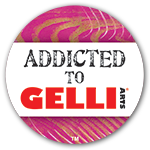 Categories: art, Gelli plate monoprints, stamping | Tags: Gelli plate, how-to | Permalink.